As TV2 channel reports, two Danish zoos (Copenhagen Zoo and Givskud Zoo) offered local citizens to donate their unwanted pets as food to predators. “It's good for the animals to have a varied diet, so it's not always a horse or a cow. Plus there is fur that is fun to chew on, and their intestines are super-healthy for them,” Copenhagen zookeeper Sophie Eller told Denmark’s TV2 channel. Also she thinks that people would prefer something “meaningful” to happen with unwanted pets, rather than just having them put down and incinerated. This refers to small pets such as hamsters, guinea pigs, rabbits: “Feeding dogs or cats to predators would be unethical because it's not natural for them.” Pets’ owners have the possibility to witness the process. The Centre for Humanistic Ecology and Culture Development makeы an animadversion upon such practices. In wildlife any animal has a chance for survival when meeting predators whilst coldblooded use of people trusting pets as food for predators is amoral and cruel. Pets that owners don’t want anymore should be taken to animal shelters where they have a chance to find new owners and where they will be taken good care of. It is not the first time the Danish zoos show their antihumanity and cruelty towards animals. So, for example, there is a practice of culling “superfluous” and “genetically inferior” animals, dissecting them in public and feeding to predators. Often, children are invited as spectators and assistants during the butchering of killed animals. One of the most recorded cases is the killing of Marius the giraffe that the Copenhagen zoo refused to sell out of principle for $1 million to people who tried to buy him and save. 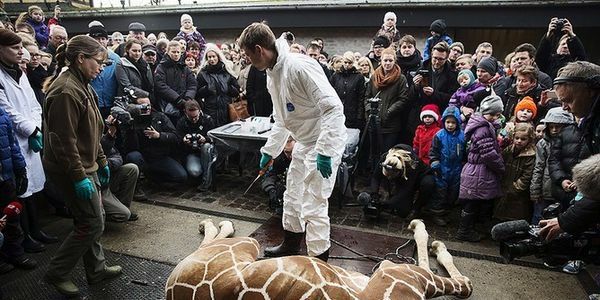 The scientific director of the Zoo Bengt Holst, who speaks out in favor of euthanasia and dissection of animals in public, was named then “Man of the Year” in Copenhagen. Considering the above we make the appeal to all zoos around the world for suspension of the cooperation with zoos of Denmark till they give up their barbaric dehumanized practices. We call caring people of good will for signing this petition.